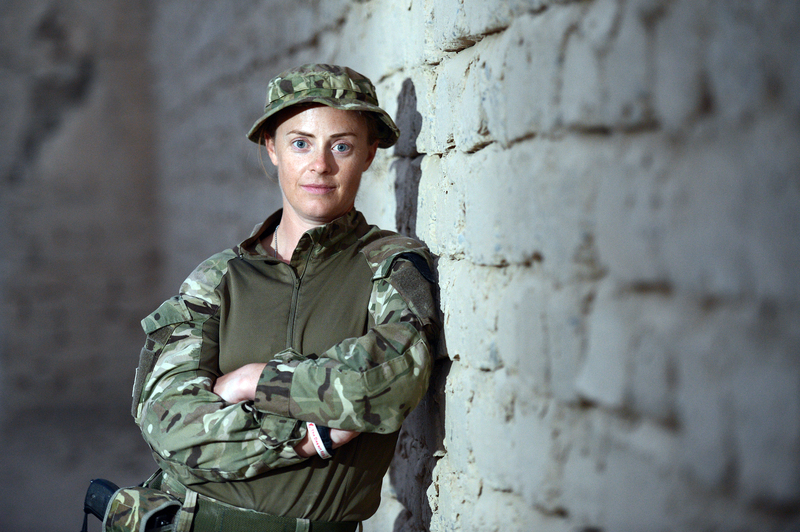 Lieutenant Claire Jackson is team leader for the British Army’s combat camera team for Herrick 19. She works alongside Sgt Dan Bardsley (photographer) and Sgt Paul Shaw (video cameraman). 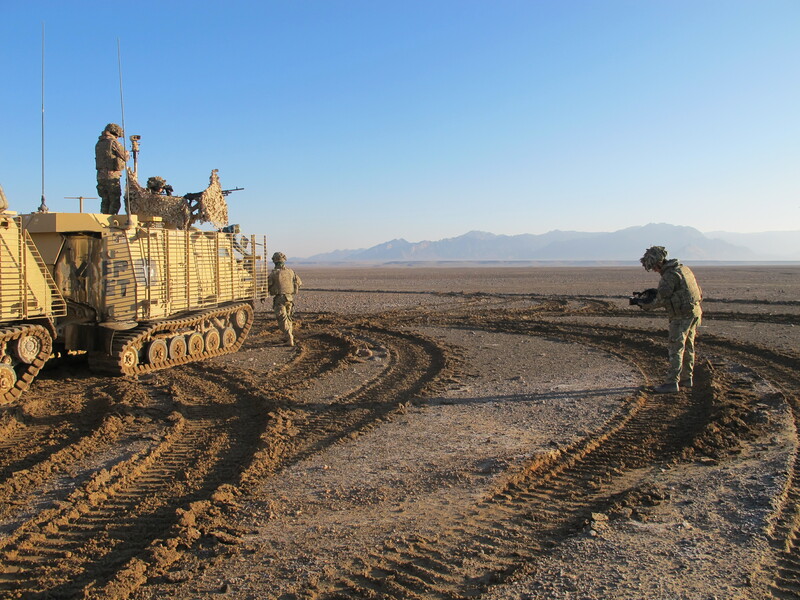 They are based in Afghanistan and will be covering the work of the Armed forces, in particular 7th Armoured Brigade – the Desert Rats, throughout the winter. They capture moving and still imagery from events out on the ground that national broadcasters don’t have access to. It seems like only yesterday when I was packing my bags, trying to force a kit list as long as my arm into two military bags, saying goodbye to friends and family, and boarding a plane laden with body armour and helmet with mixed feelings about the next six months. They were mainly feelings of excitement, nervousness and slight panic. What had I done? I had given up a perfectly good job and left my boyfriend (now fiancée) and creature comforts to go and live in the desert in a tent working alongside different ranks from all three services, entering into a whole new world. So six months on….was it what I had expected? I guess the military side of things in terms of day to day living was pretty much what I had imagined. I got used to not wearing make up and jewellery quite easily and not having to choose what to wear each day was one thing less to worry about each morning. I soon made myself at home in my little ‘pod’ (corner of the tent that we sleep in) – it was actually very cosy and had a feminine touch to it. It’s amazing what you can do with a few fairy lights and a bit of tinsel in terms of livening up a living area. 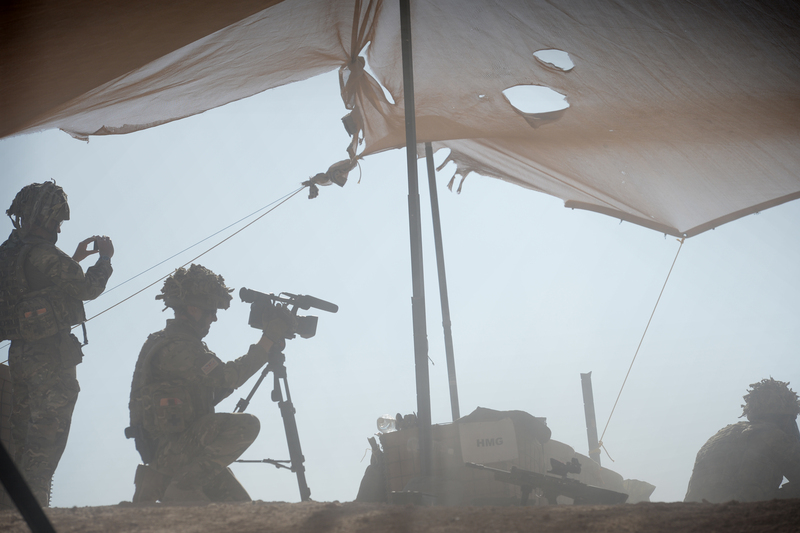 The job itself – Officer Commanding of the Combat Camera Team (OC CCT) has been a real challenge but then that’s what I wanted when I signed up for this tour. 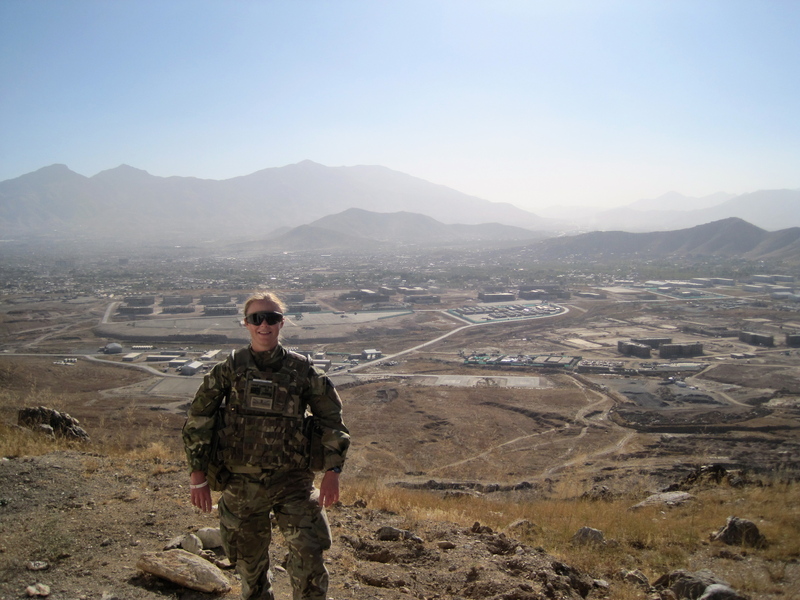 I wanted to play my part with the troops, I wanted to see a new country and experience other cultures, but mostly I wanted to put all my training into practice to prove that I had earned the right to an Officer commission. The biggest challenge I‘ve found being a reservist and having only been in a few years, was the military jargon that is used on a daily basis – the number of different acronyms, unit names, and regiments, flashes (badges) and their roles within the battlegroup that everyone seems to know off by heart. 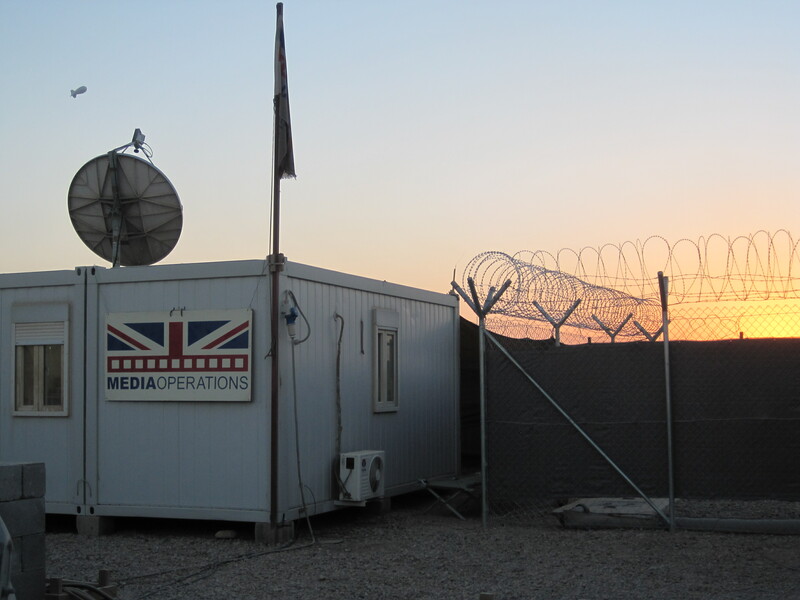 By working on a number of stories with the CCT each week though gave me the opportunity to start remembering a vast majority of them through meeting people in different roles across the whole of Op HERRICK from Camp Bastion to Kabul, Khandahar and Lashkar Gah. This has given me a real insight into the day to day running of operations and how everyone plays a part no matter how large or small. From the soldiers who provide force protection on the perimeter fence to the ATLOs (Air Transport Liaison Officer) who check in the passengers and their baggage at the flight line, to the engineers who are helping with the base closures, to the officers who are providing education to the troops in their downtime. Everyone has a part to play and I feel very privileged to have been given an insight into this operational world. The CCT out on an op with the Warthog group. Lt Claire Jackson. 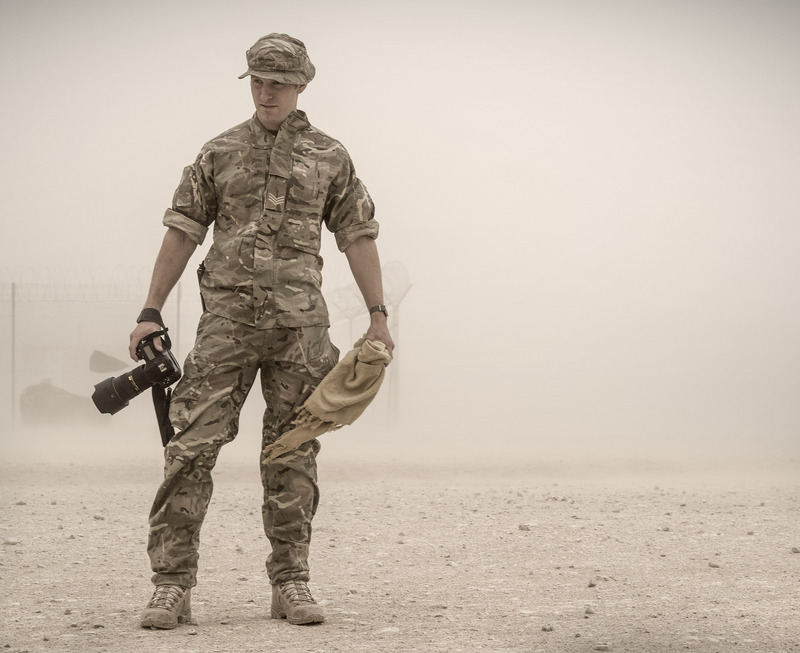 The first thing that strikes you as you arrive in Camp Bastion is the dust. 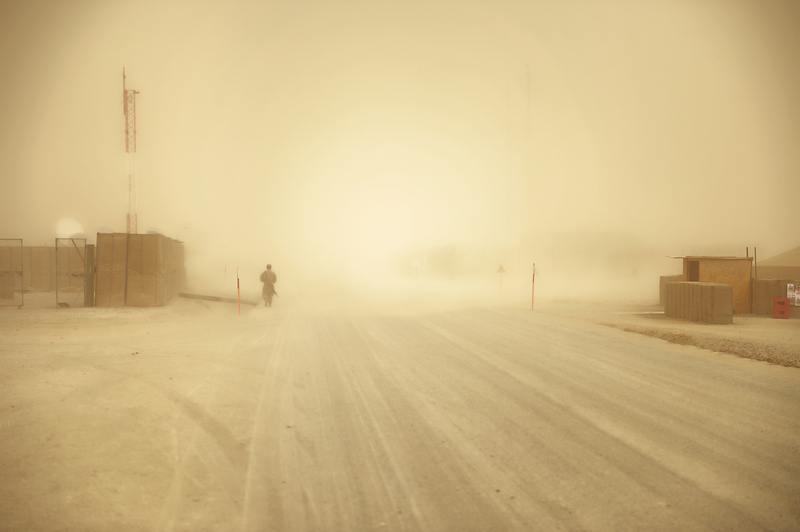 No matter what time of year it is, there is always a certain level of dust. 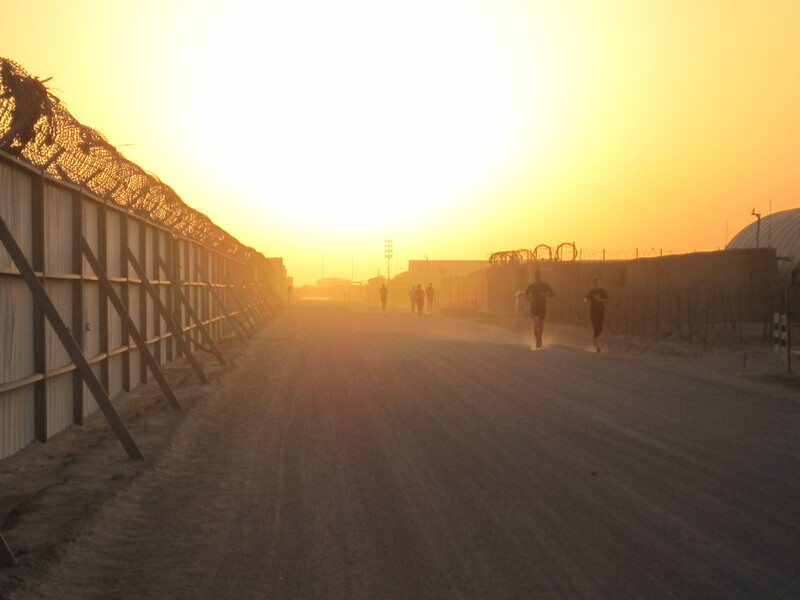 For the first few months when we got out here most people avoided running in the day, preferring to stick to the early morning runs before the traffic around the camp starts to build up. 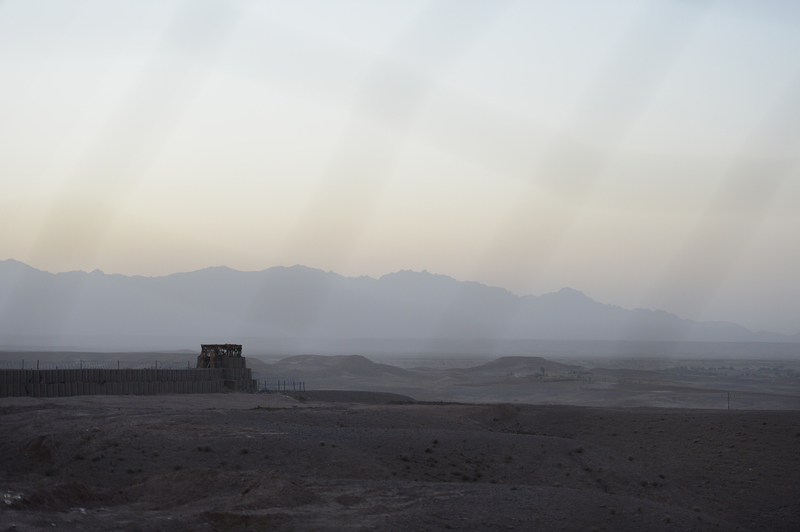 Then in complete contrast to the heat and dust that consumes Helmand Province for most of the year, the temperature drops a fair bit in the winter. In preparation I had packed my cold weather gear and have made full use of it, especially when we got caught off guard with several inches of snow a few weeks ago. Not once did I think I would be building a snowman on my tour! Covering VVIP events has been a key part of our role, but I must admit I didn’t think we would get the chance to work with so many. Our tour started off with Teresa May, Home Secretary, followed by HRH Duke of York who came out for Remembrance, then the very memorable ITV production which saw Gary Barlow ‘singing to the troops’. The tour continued on with a visit from the Prime Minister, David Cameron who came out with the England football player, Michael Owen to announce a bid to launch a new UK-Afghan football partnership to boost the sport by developing the existing league system. There was also a visit from the lovely welsh opera singer, Katherine Jenkins who flew out to Camp Bastion to make a last appearance to the troops before they leave Afghanistan. A very petite and stunning lady with such an incredible and powerful voice. I must admit I wasn’t looking forward to spending Christmas in Afghanistan, but one thing for sure is that it will definitely be one to remember. 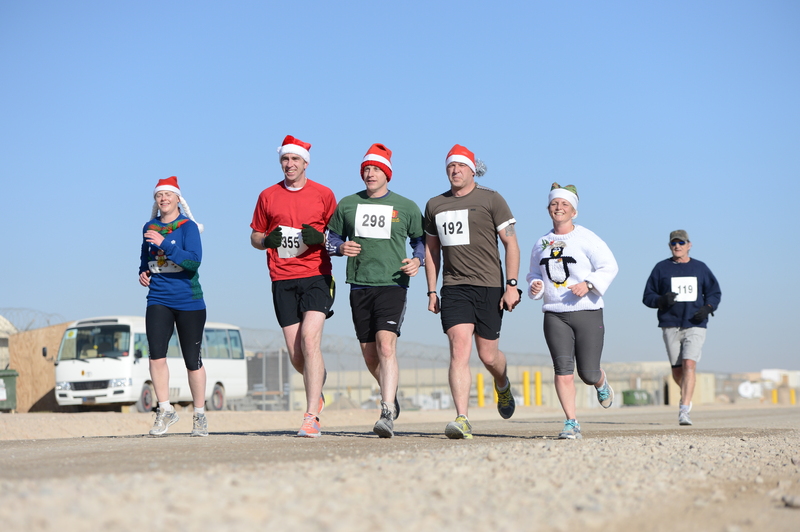 The day started off with a fancy dress half marathon around Camp Bastion and Leatherneck which was great fun and a bit different from the usual Christmas morning stroll across Dartmoor. Then back to the office to upload imagery to the various broadcasters before heading off to interview the troops enjoying their Christmas lunches in the canteen which was the full works (but sadly still served on paper plates) – Turkey, stuffing, crackers and party hats, and non alcoholic fizz! Then finally time for our Christmas dinner before one final bout of work uploading the last few bits of footage and imagery back to the UK in time for the morning broadcasts. And all our hard work paid off with mentions in most of the big national papers, Sky News, BBC and ITV. In terms of places and people who have left a lasting impression with me, at the top of the list has to be the Afghans themselves followed by the capital city, Kabul where we spent a week filming them for an internal video for the Afghan National Army Officer Academy (ANAOA). Our first encounter with any Afghans was at Shorabak when we saw them proudly marching across the parade square at the opening ceremony for their new battle school (RCBS). We then spent some more time later on during the tour at Shorabak with the Brigade Advisory Team (BAT) who were training the ANA on their weapon systems. On all occasions they have struck me as being very receptive and wanting to learn. 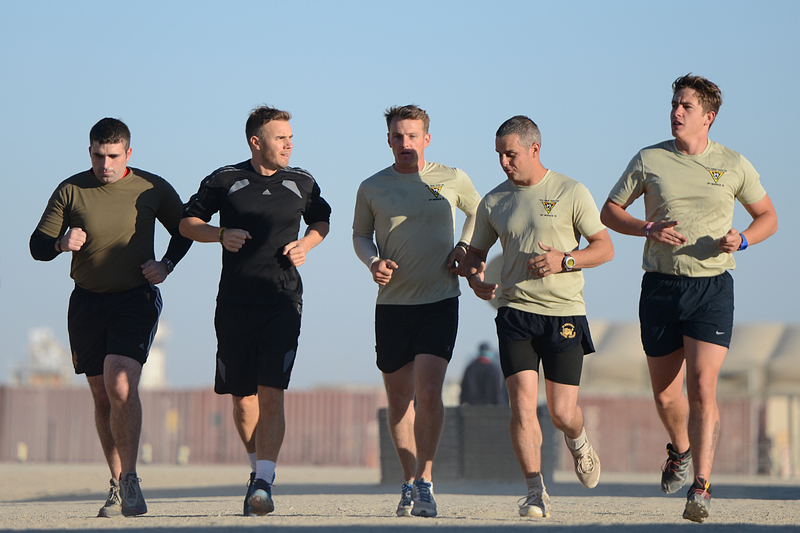 They have come on in leaps and bounds and are improving every day now that they have been given the opportunity to take the lead on operations with the ISAF troops in a mentoring and liaison role. 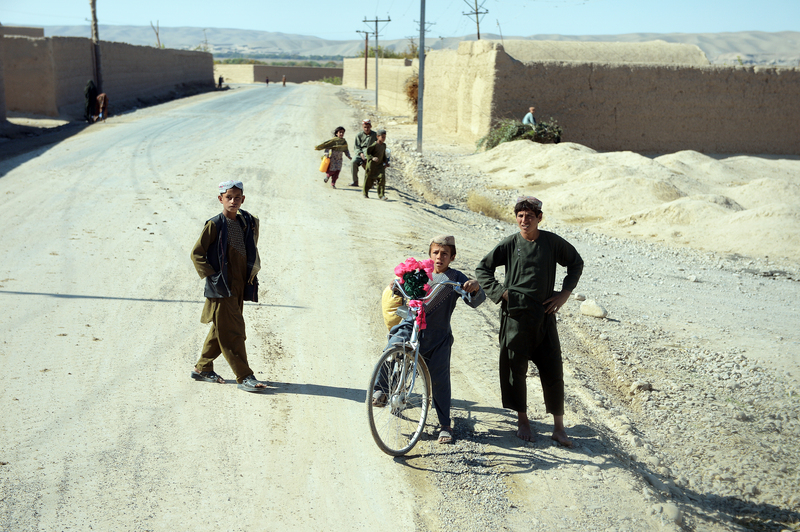 Another highlight has been the encounters we have had with local Afghans. The locals generally tend to be very friendly and curious and love having their photos taken. We take it for granted that we can capture photos so easily but for some of them they have never even seen a photograph of themselves or a camera. I will be taking back many memories from this tour, with plenty of ‘war’ type stories to tell the kids in years to come. I can’t believe it was only a few years ago that I passed through Sandhurst and talked amongst the other newly commissioned officers about going on operations at some point. I honestly didn’t think I would have the opportunity to get onto Op HERRICK but here I am having successfully completed a six-month tour in Afghanistan. Goodbye 2013 and hello 2014! 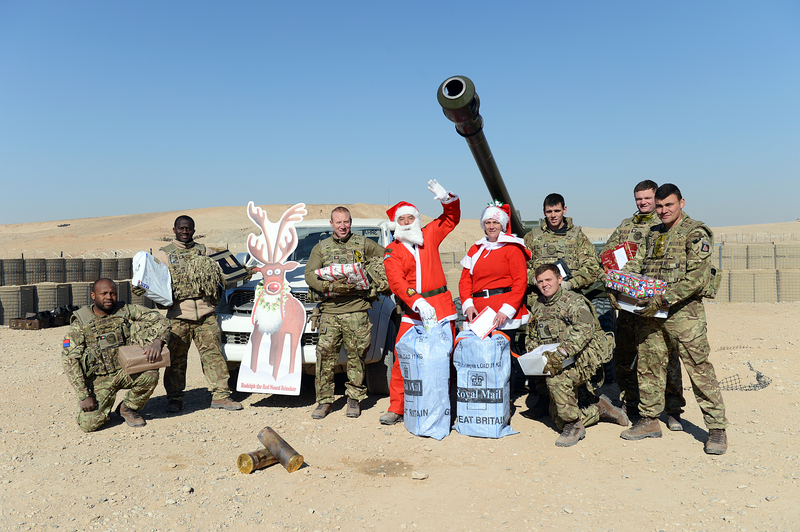 My last blog ended with Christmas festivities around Camp Bastion and highlighted the last few weeks prior to our RnR which we were very fortunate to get over New Years Eve. So not only did I get a Christmas Day in Afghanistan, I got to eat Turkey and stuffing all over again, drink mulled wine, and open more presents when I got back to the UK thanks to my parents. It was so nice also to remind myself that there is still a bit of femininity lurking beneath the Army greens having worn no make-up and had my hair scraped back for the last 4 months. So time to get out the little black dress and dancing shoes, and welcome in the New Year. And what a great start to 2014! 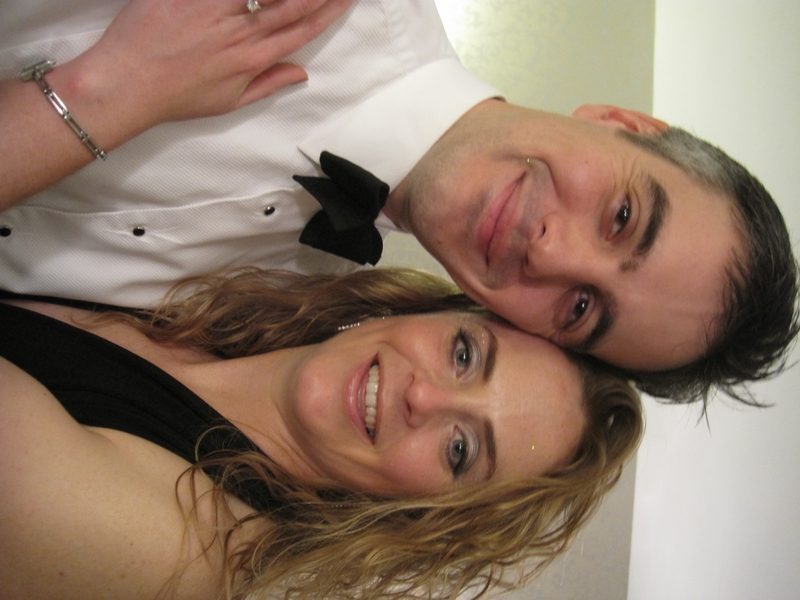 My boyfriend, or as I should be referring to him these days, my fiancée…. popped the question on New Year’s Eve. So now I am the very proud owner of a beautiful diamond ring which is safely locked up in the UK ready for my return in March. Transformation. It’s amazing what a bit of make-up and a black dress can do to ones image and self confidence! So back to the desert on a high, head buzzing with lots of wedding ideas (the real planning will have to wait until the tour finishes) and 8 weeks left until the end of tour. I wonder what stories are waiting to be discovered upon our return. The first tasking we are given is in preparation for International Women’s Day on 8 March which celebrates the role that women have played and continue to play in conflict resolution and peace building. We’ve been asked to collate a list of women in the military involved in such roles and collect supporting imagery and footage. Having spoken to a number of units around camp we have a list of potential candidates all lined up ready to be interviewed and talk about their roles in theatre and civilian roles if they are Reservists. After several trips out the data and images are recorded and a short list is compiled with an array of interesting stories ranging from a Movement Controller from Hong Kong who has a Masters in Crime Science but enjoys the military life and is thinking of becoming a Regular soldier, to a Senior Insurance Underwriter who is out here as a Troop Commander with 2 Close Support Logistic Regiment and is responsible for planning and implementing the Combat Logistic Patrols to and from the remaining bases. Both have very different roles but at the same time they are both contributing to the withdrawal of all British troops by the end of 2014. We have been very lucky with the weather during this tour having been told that the winter is pretty wet and miserable in Afghanistan. Most days we have been waking up to a clear blue sky with just a slight nip in the air, and some amazing sunsets. The good weather seems to running out though and over the last week there has been a couple of storms with snow forecast over the next few days. A great opportunity for both Dan and Paul though, and some stunning images I’m sure. Not many people know that the water we drink in theatre comes from Afghanistan. Everyday approx 48,000 litres of water are pumped to the surface to quench the thirst of the troops in Camp Bastion and the remaining bases. Not all of it is treated and used as drinking water though, some of it is used to supply the toilets and bathrooms with running water, or as a dust suppressant around camp. 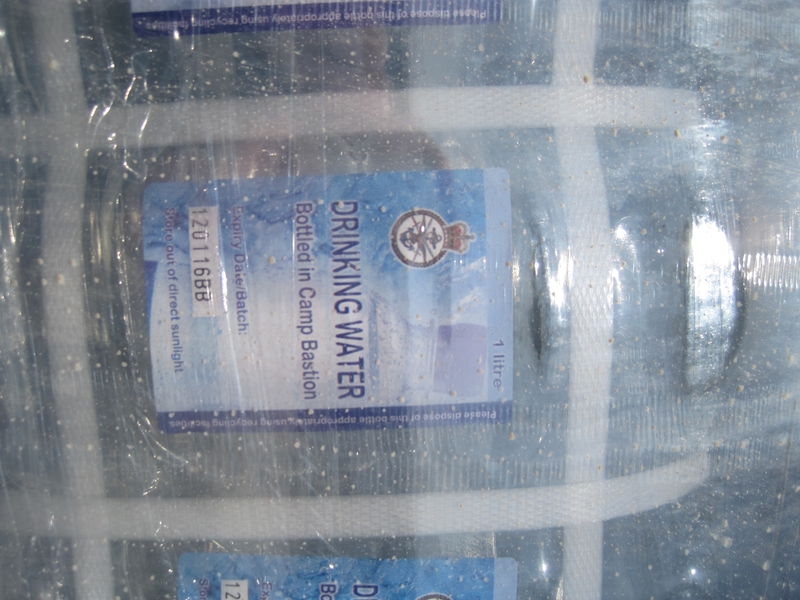 When we were initially asked to capture footage of the Camp Bastion water bottling plant I wasn’t too interested in the tasking, especially once we arrived and were told we were going to be given the full tour of the plant. I felt like we were going back to our school days with the random trips out that were supposed to be educational. 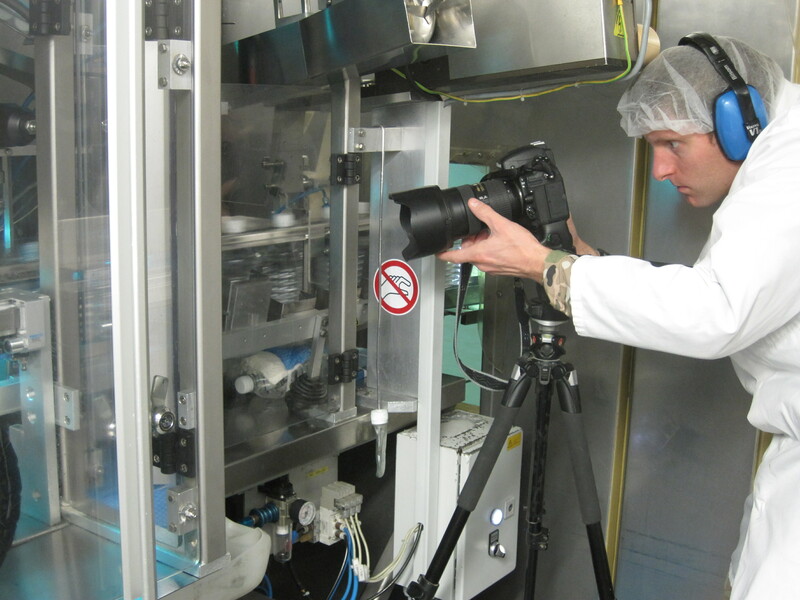 But having donned a hairnet, boot covers and a white lab coat, Paul and I headed off with video camera in hand to find out how the tiny plastic test-tube shaped containers that arrive in Bastion end up bottle shaped and filled with drinking water with their own ‘Bastion Drinking Water’ labels. 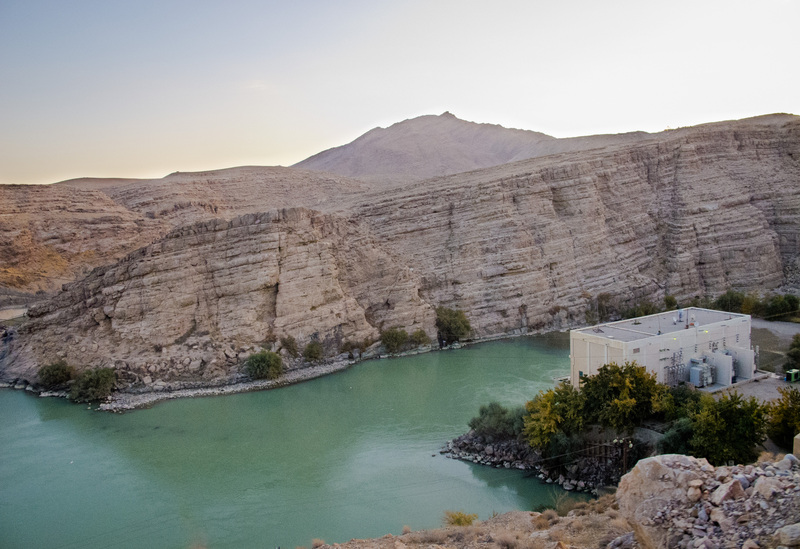 By having this water bottling facility in Bastion it has meant that money can be saved by not having to send truck loads of water across the desert. The plastic used to produce the bottles is a lot tougher than commercially produced bottles and gives them a longer shelf life (2 years rather than 12 months). They are also more robust to allow them to be air-dropped when supplying the forward operating bases. 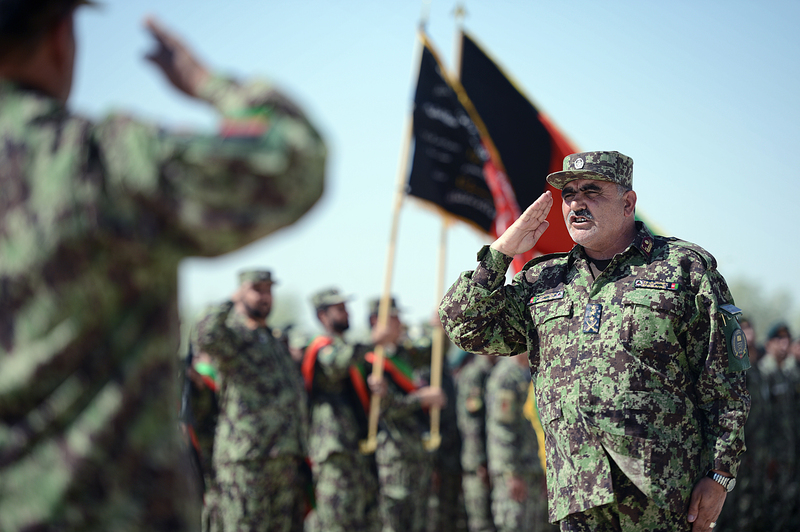 The focus over the past year has been for the Afghans to take the lead in operations in preparation for the withdrawal of ISAF troops. 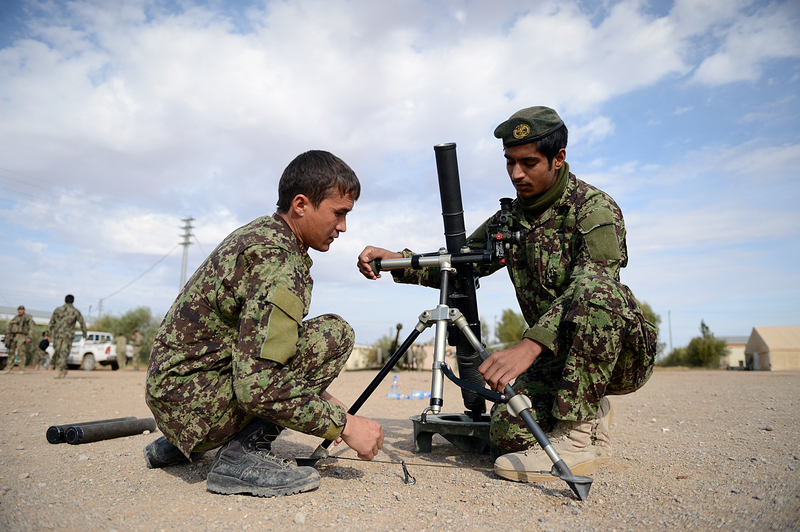 As part of this process British troops have been mentoring and training the Afghan National Army (ANA) in a number of ways. 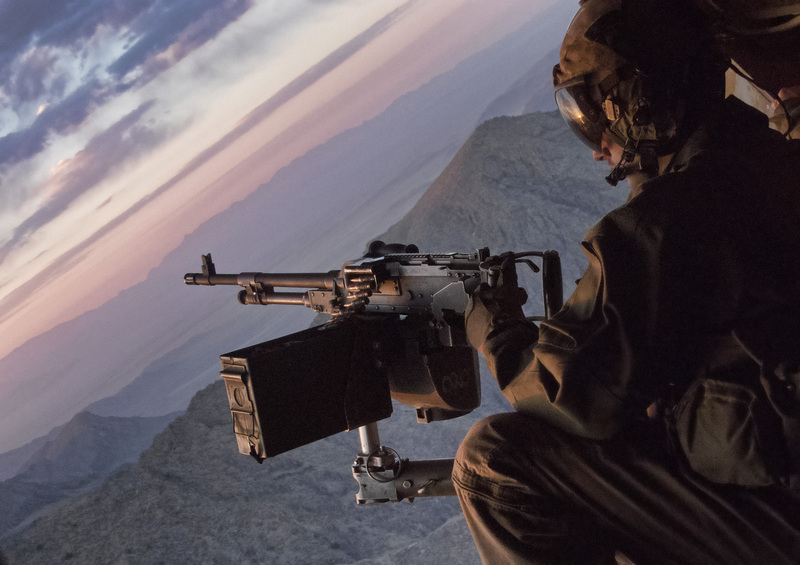 The Kandak Liaison Team (KLT) made up of soldiers from 3rd Battalion, the Mercian Regiment and a number of attached Reservists from the 6th Battalion, the Rifles deployed alongside the ANA on an op to drive insurgents away from populated areas. 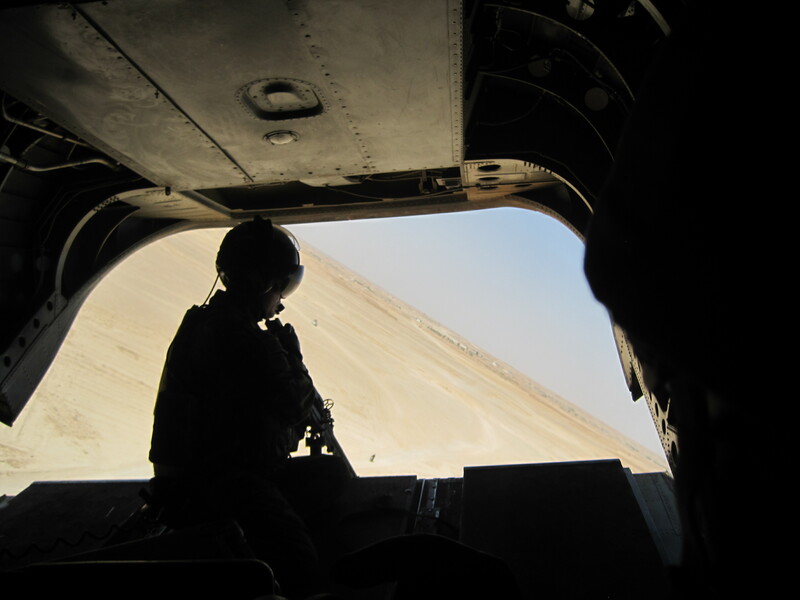 The CCT were offered at short notice a couple of seats on the op to capture the ANA at work. Sadly there were only two seats so I had to stay behind whilst Dan and Paul headed off in anticipation of a few days out on the ground. The op was a great success all around with the ANA seizing and destroying a vast quantity of illegal fertilizer which is used for making explosives, and with them requiring minimal support from the KLT having taken advantage of the ISAF training they have received to lead the operation from start to finish. As we draw nearer to the end of OP HERRICK it’s very rewarding to see how much we have helped the Afghans in terms of winning the fight over the Taliban. The ANA have improved in leaps and bounds from the memories that soldiers have recalled from previous tours. It’s that time of year when everyone reflects on the past twelve months in terms of what they have or haven’t achieved, and what their goals and aims for the following year are going to be. Looking back on my year, or even the last few months since beginning this tour, I would struggle to list all the memorable experiences we have been so fortunate to have witnessed on this tour. I knew when I volunteered for Herrick 19 that the sort of taskings we were going to get would be very different from the previous Combat Camera Team (CCT) tours, and to be honest I was worried that we might get bored and be struggling to find work. But how wrong was I. 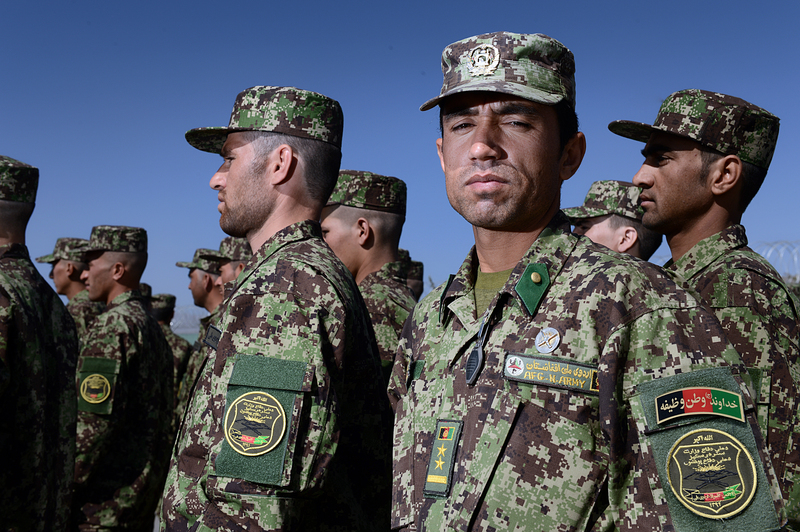 We may not be out fighting on the front line any more, but we are still contributing in a training and advisory role, with the Afghan National Army taking the lead. 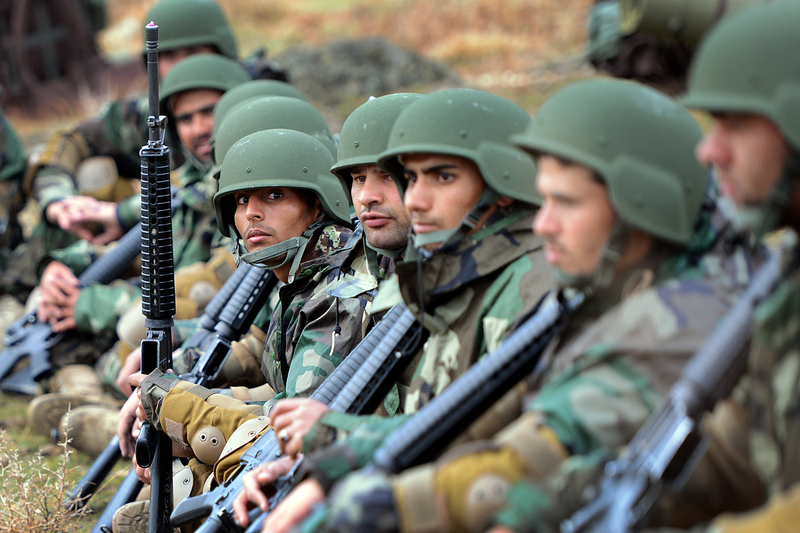 A few months ago we were asked to cover the opening of the Afghan National Army Officer Academy in Qargha, Kabul. Over 200 officer cadets arrived dressed in their chemises and flip flops with long hair and beards. Within a couple of hours they had been issued kit, had their hair cut, and were dressed in military uniform, standing very proud on the parade square. It was an incredible transformation. One month later, we were invited to go back to the ANAOA to capture the cadets on their first field exercise. This brought back several memories from my officer training weekends and time at Sandhurst – leopard-crawling through the grass, and being told to get down lower! They also went through a variety of other field exercises, including patrolling and crossing obstacles. It was great to see them working together and with a real sense of professionalism. 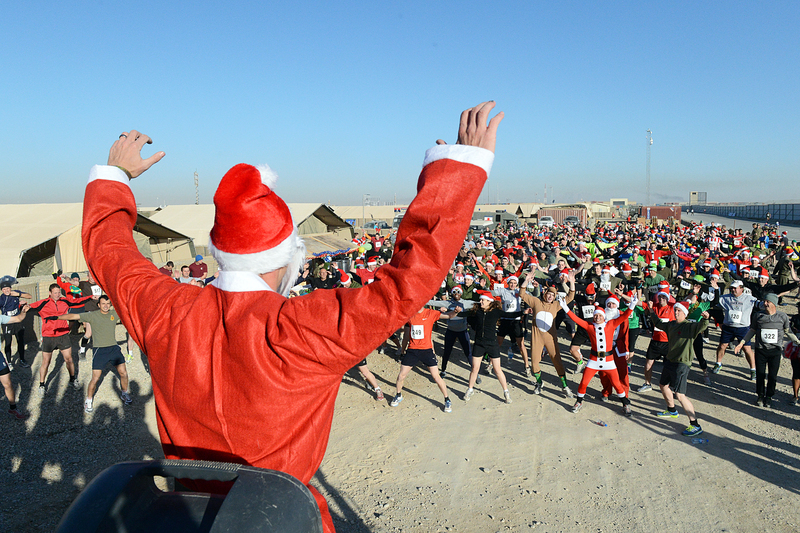 I had no idea what to expect when I found out that I would be spending Christmas Day in Afghanistan. All I knew was that it would be very different from the usual home rituals – waking up and opening a stocking, a morning walk across the moors, a bit of mulled wine and nibbles, present opening, then a late lunch followed by several hours of gorging on chocolates, watching movies. 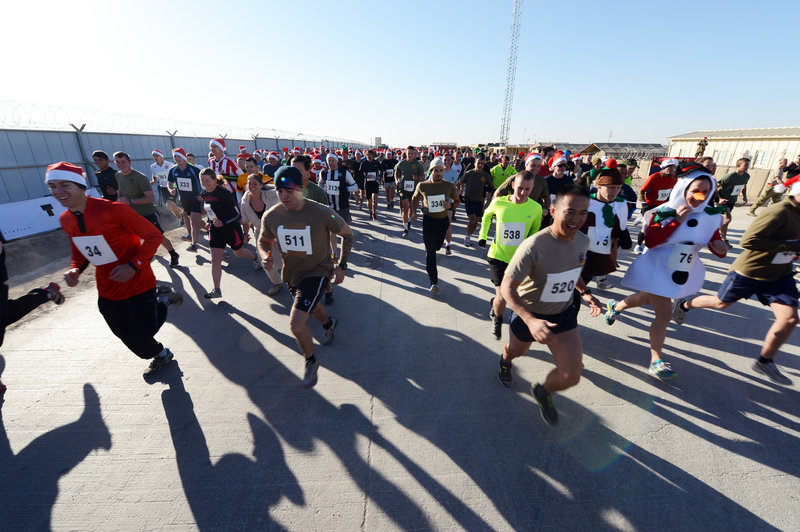 Well the gorging on chocolates was there this year (and still is – detox starts in the new year), but the walk was replaced by running a half marathon (two laps around Camp Bastion) whilst wearing a festive jumper with 500 other mad festive characters. Having survived the run, after a bit of editing we headed out to Christmas lunch in the cookhouse. The meal consisted of the typical festive food that you would expect on Christmas Day, but was eaten with plastic cutlery and paper plates and accompanied with the usual array of non-alcoholic squash and water. The afternoon was spent pushing out press releases and uploading footage and stills that we had captured over the past few days, ensuring that the British media got what they needed for the daily news bulletins. And what a lot of coverage we got across TV and newspapers over the next few days. 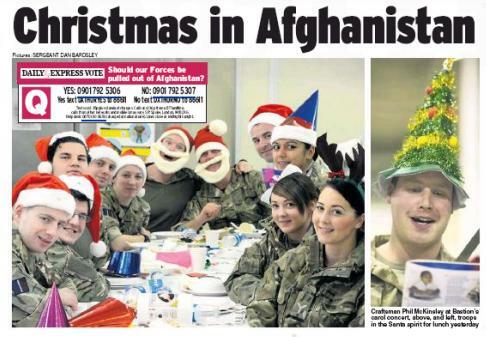 Good job all round, AMOC (the Afghanistan Media Operations Cell)! Another year almost over, and time for the CCT to head back to the UK for a well earned bit of Rest and Recuperation (R&R) and battery recharge, ready for the final few months of the tour in 2014. 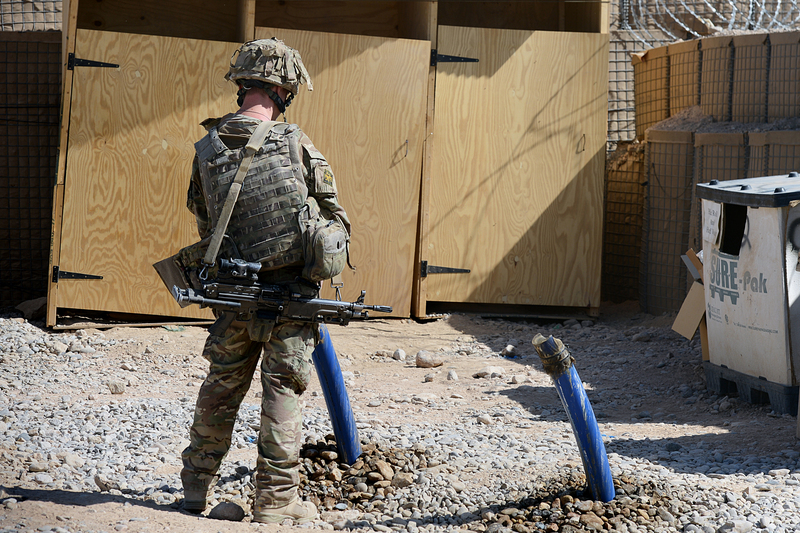 Things are definitely winding down in Camp Bastion, but there is always a story to be told, whether it’s the closing down of a forward operating base (FOB) or a new character in town. That’s the great thing about this job – you never know what the next tasking will be. 12 weeks in and we’ve reached the halfway point of our H19 tour. 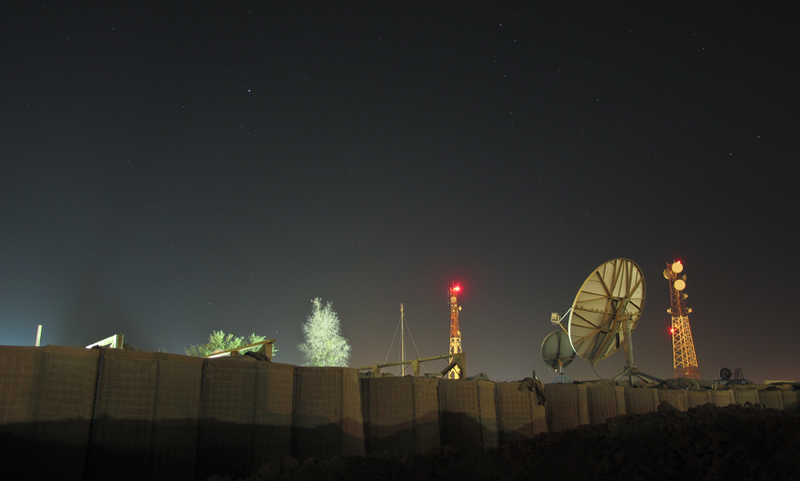 It only seems like yesterday when we arrived a bit dazed and tired in the middle of the night into Camp Bastion. I still have to keep reminding myself at times of how lucky we are to be doing this job, with such a diverse range of taskings. And for me being a Reservist, and this my first tour, it’s a real privilege. 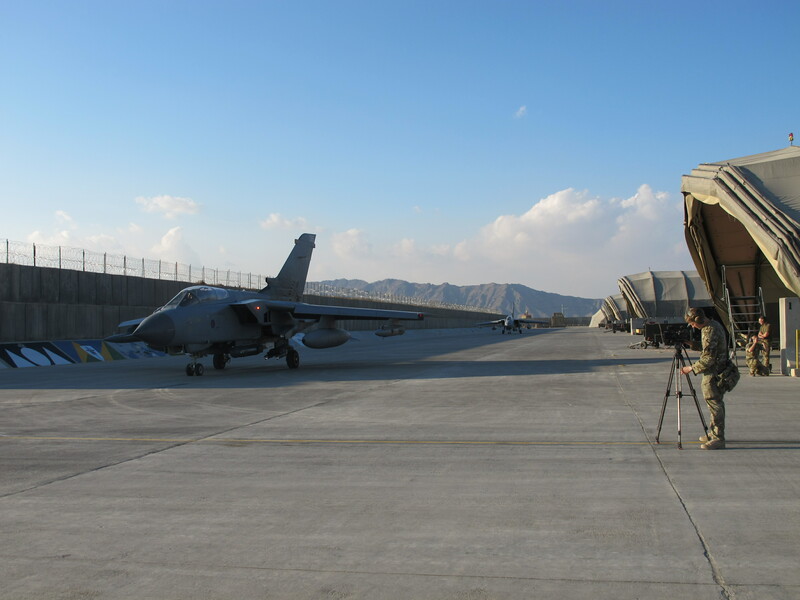 As I’m writing this I’m sat in front of a Tornado GR4 watching pilots and crewmen doing their various pre-flight checks, the huge ‘Three Mile Mountain’ in the background towering over Kandahar airfield. A bit different to the view outside the office window in the UK that I’m used, and more like a scene from Top Gun. 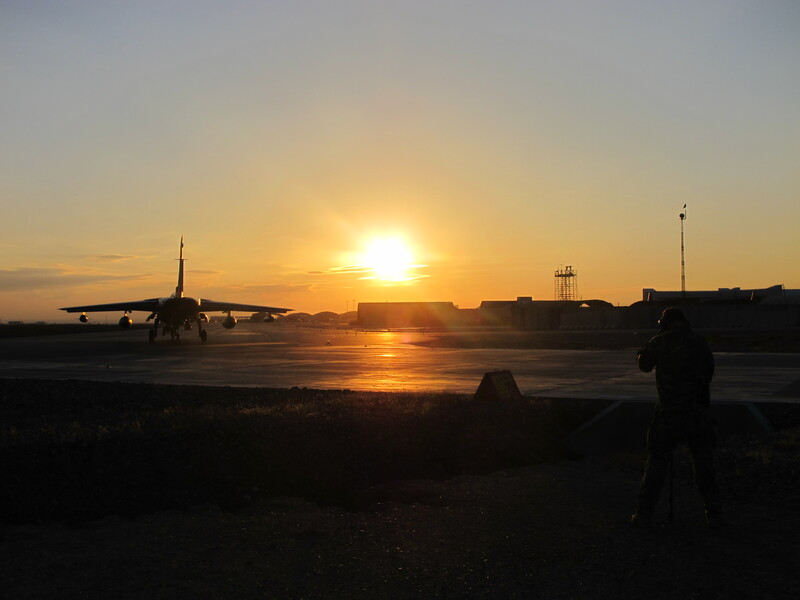 We’re here to capture some footage with 617 Sqn, part of 904 Expeditionary Air Wing (EAW), known as the ‘Dambusters’. “Take my breath away…” Just like a scene out of Top Gun! 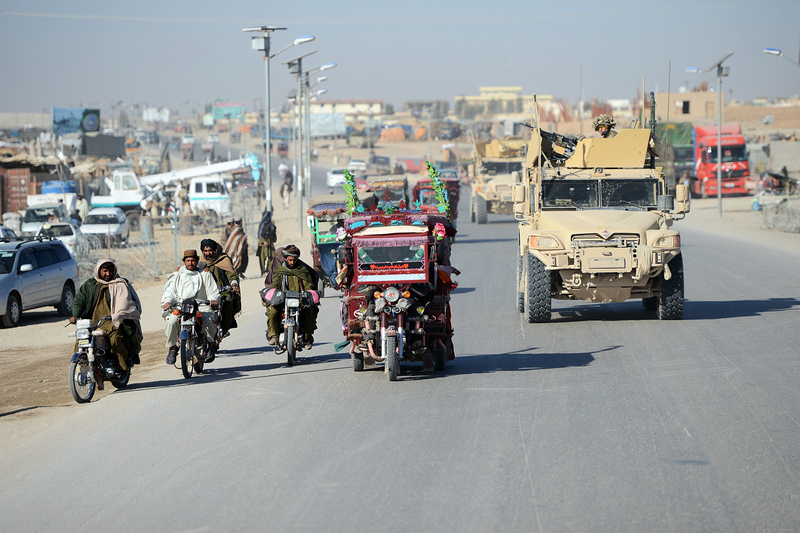 This is our second trip to Kandahar. 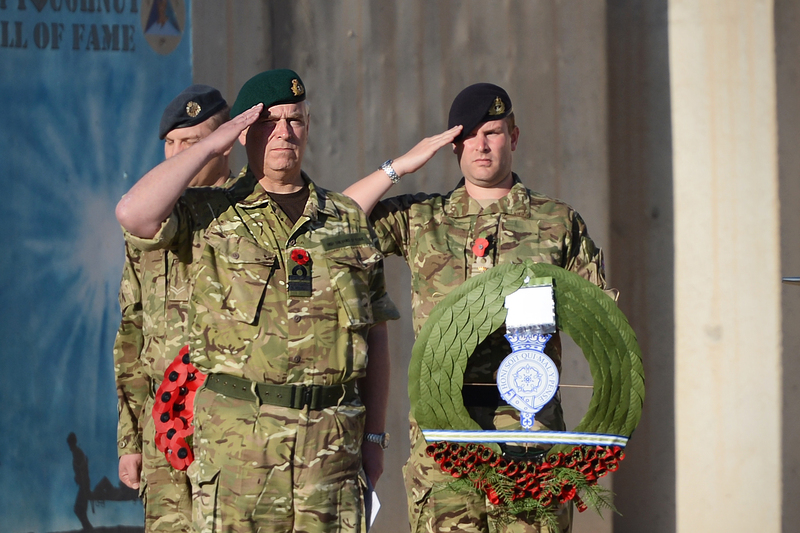 We were here only a few weeks ago to capture HRH, the Duke of York at a Remembrance Service. I got very excited as I was told that there might be an opportunity for us to interview him. So with questions already prepped and signed off, we waited patiently at the flight line for him to arrive only to be told that he wasn’t doing any more interviews as he’d already done a fair few in Bastion earlier that day. Oh well, next time I might be more lucky to get a VIP interview. The Duke of York isn’t the first VIP visit that we have covered on this tour. We were very lucky to be involved in an ITV production, which was hosted by Take That’s Gary Barlow. For two weeks we had a large TV crew living with us. A great bunch of people from the world of tv production and one that I’m very familiar with, so great for a bit of networking. I’m going to need to start looking for a job once this tour is over! And, another VIP visit last month when Katherine Jenkins came out to sing to the troops. One memory that I will definitely be taking back with me from this tour is a recent trip to Kajaki, a tasking for the Provincial Reconstruction Team (PRT). 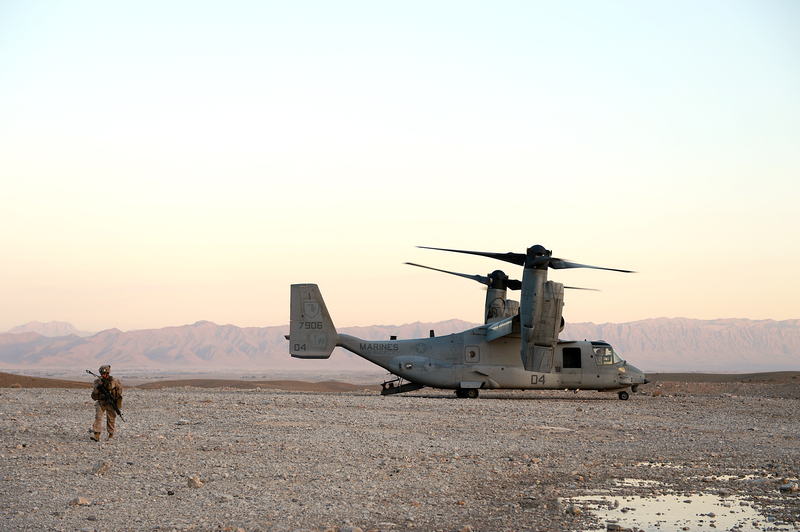 Not only is the place breathtaking, but we arrived in a V-22 Osprey. For those of you who haven’t heard of this aircraft, it’s a tilt-rotor aircraft that takes off and lands like a helicopter but once airborne its engines rotate to convert the aircraft into a turboprop plane capable of high-speed, high altitude flight. It looks just like an aircraft from the set of Avatar! We took off in the pitch black early hours of the morning with the rear ramp open just like in a Chinook. A very strange feeling once the aircraft has taken off vertically like a helicopter only to then switch into plane mode and shoot up into the sky at an angle, with the rear ramp still open, and the gunner sitting very comfortably on the back. All I’ll say is just hold on to your bags! 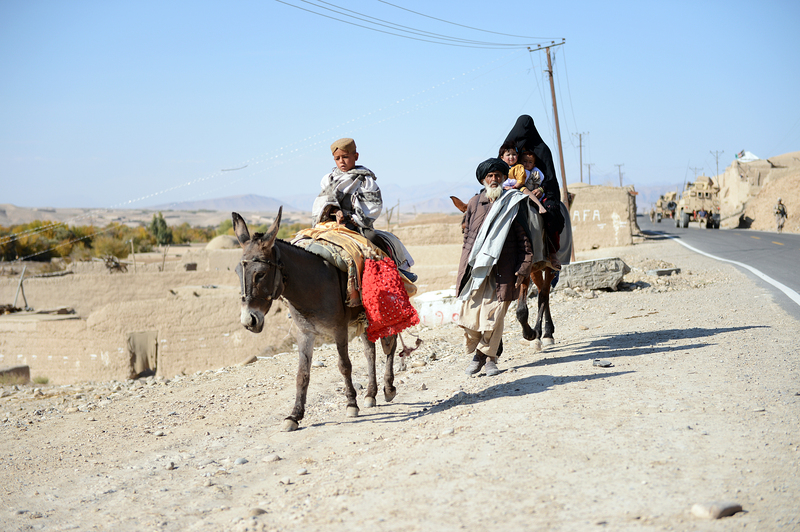 The PRT has been responsible for a number of development projects in Helmand Province. 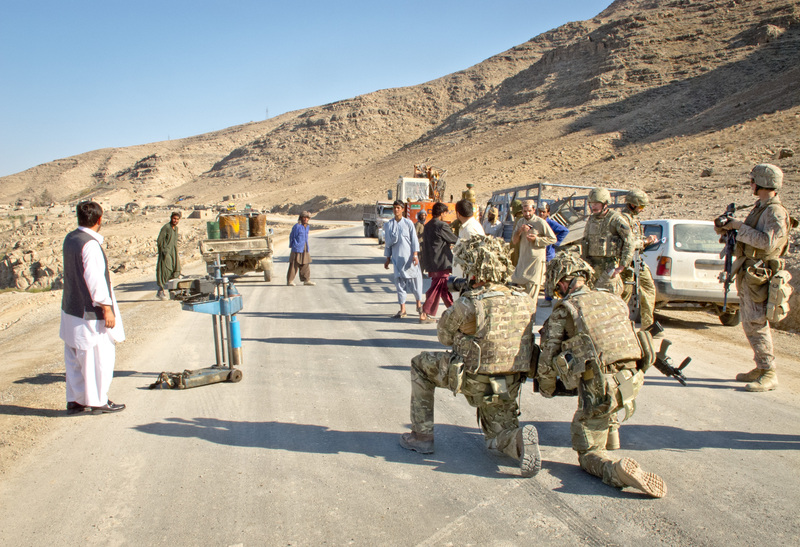 Afghan contractors have carried out construction work on Route 611 which has been routinely monitored by a team of Royal Engineers from the PRT. We were out filming with the Engineers on the ground, which prompted interest from the local Helmandi population. We were greeted by loads of happy and curious children and adults eager to see what we were doing. An amazing few days in Kajaki. Just seeing how the work on this route has improved the lives of the locals is such a great feeling. The smiles on the kids’ faces say it all. This is one trip that will stay with me for a very long time. 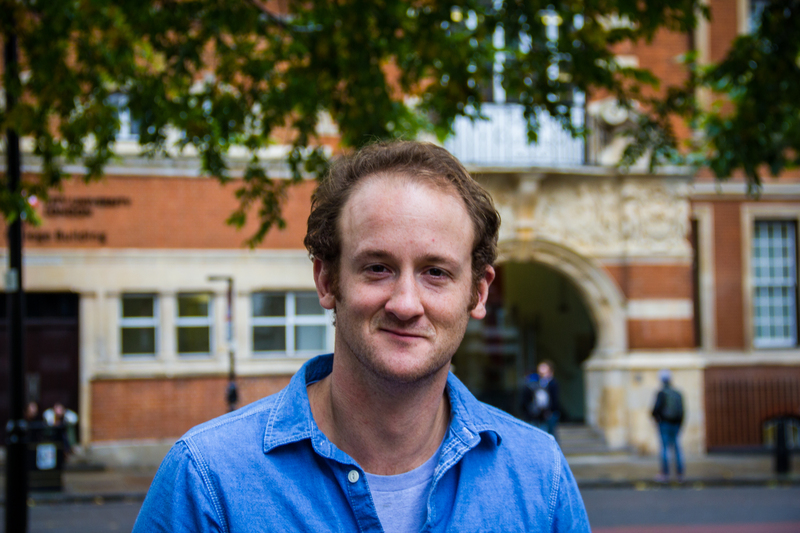 Captain Mau Gris began this blog when he was team leader for the British Army’s Combat Camera Team (CCT) based in Afghanistan throughout the summer 2013 as part of 1st Mechanized Brigade on Op Herrick 18. Mau returned to the UK at the end of September 2013. The rest of his blog will focus on leaving the Army and going back to the life of a civilian. 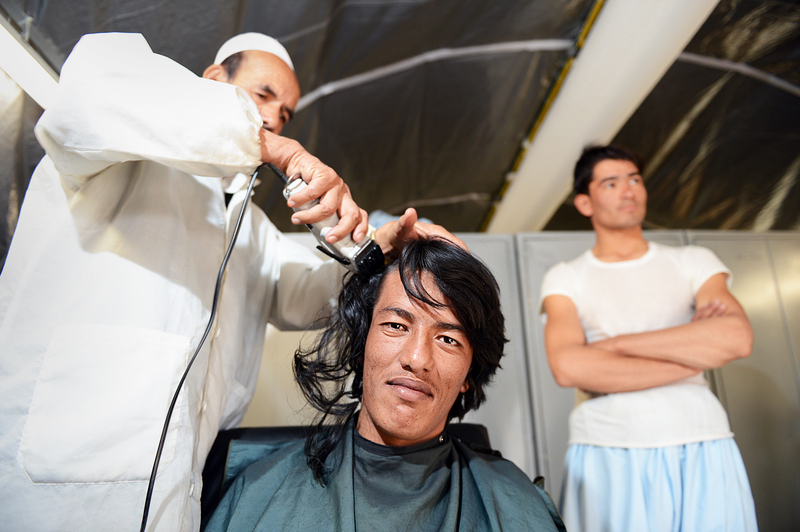 For Mau, this includes going back to university – trading his helmet and combats for a mortar board and gown. I can only imagine the kind of angst and worry those with a family to support must experience as they go through the transition to civilian life. For me with no dependents or mortgage there is a low level buzz of anxiety, drawn from looming unemployment and being out of my Army comfort blanket. Also being back at school on the wrong side of 30 was never something I planned. In reality my TV Journalism MA is more like being back in basic training. Which isn’t a pleasant idea, I didn’t make a great start in training. I turned up with long hair on the first day, which was a massive error. A lot of people resettling won’t have to do what I am doing. For most, the CTP package which I also did, should be good enough to launch them into a job provided they do the leg work. Failing that, there are loads of people who can help. The key is knowing what you want to do. I know the area I want to be in, which has lead me to where I am now. Fortunately like most Forces personnel resettling, I am not quite at square one. 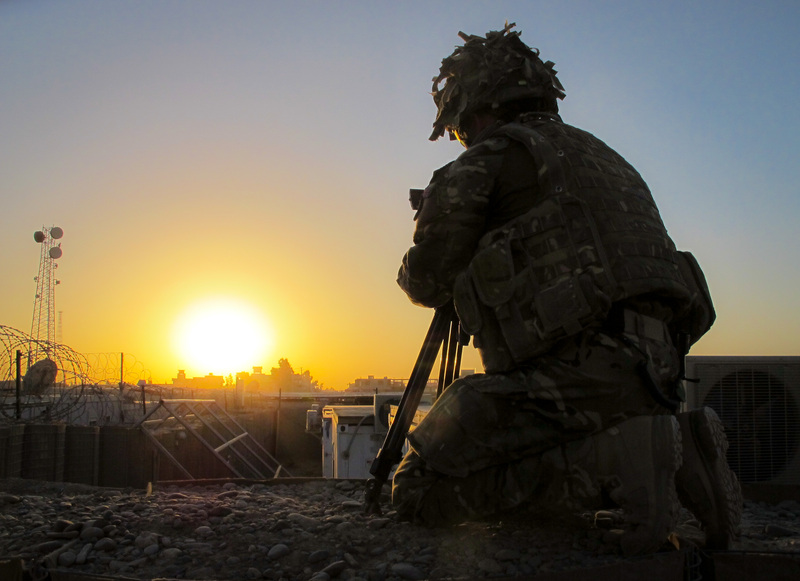 My job as a Combat Camera Team leader has given me practical understanding, experience and transferable skills. The problem is knowing how valuable they are, where to apply them and how much they are worth. If anyone knows please tweet me! For now, the course gives me purpose, and I am in the right place. The shared interest and passion makes journalists more like the soldiers then either would like to admit; once you get past the stubble and dress state. These would have any RSM howling at the moon and lashing out with pace stick in hand. Never having worked in the real world, unless you count a summer as an Punter in Cambridge, I increasingly find myself using the Army to make sense of the new civilian environment. In my MA, my lecturers are the DS (Directing Staff). Experienced practitioners in the industry who will teach me the ways of the job. The only differences are physical and environmental. My first Army DS was a 6ft 4 Yorkshire man with a shorn head, who’d deliver ‘instructions’ and ‘encouragement’ like enemy machine gun fire and with similar effect. Often peppering the platoon with wisdom when we were up to our webbing in water in some godforsaken Welsh ditch. My Masters Directing Staff is a 5ft something and a former BBC journalist. From a cosy lecture theatre, she delivers her wisdom couched in amongst anecdotes. They are different, but they are teaching you what to expect in the job. And like basic, this is the start of the job as I see it. Jack Nicholson. 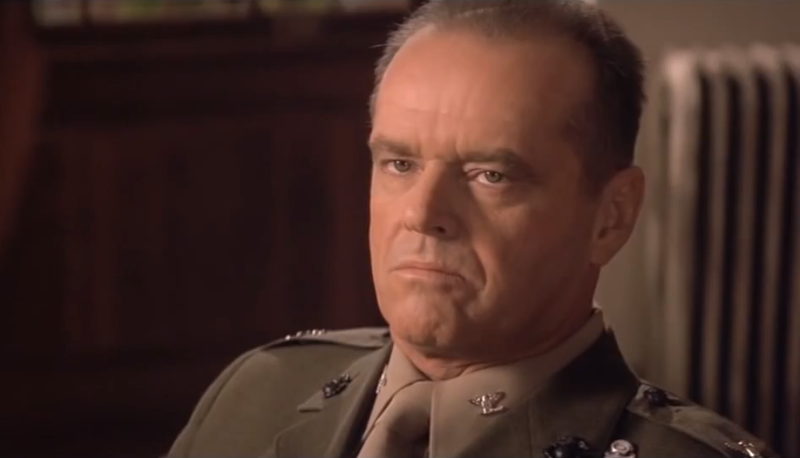 ‘You can’t handle the truth’! For all the similarities the two jobs are very different at their core. The core of any profession is in the principles and doctrine they teach. Army principles are different from journalistic principles. 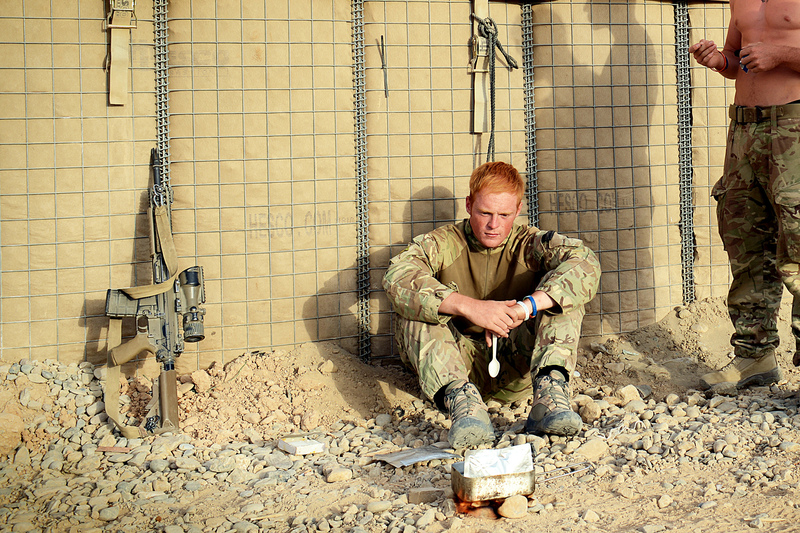 It is here that the problem lies for service leavers as they resettle. 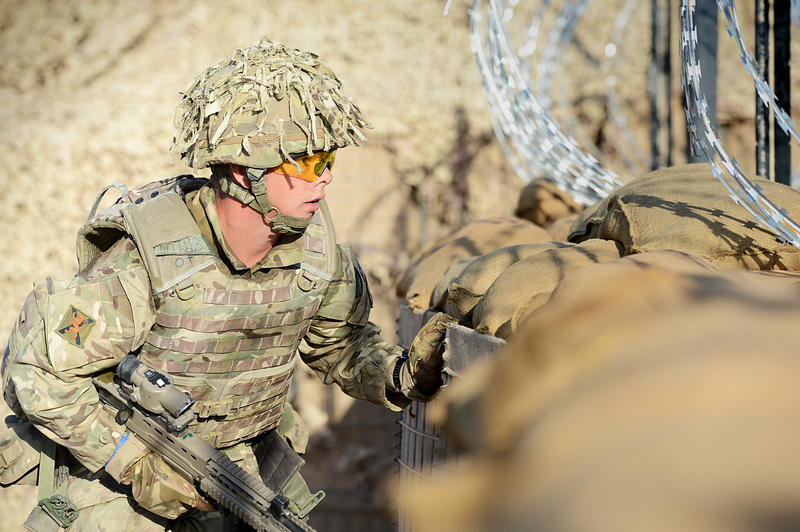 Army leavers often feel themselves to be the only ones in the workplace applying principles to their work, other than the ‘look after number one’ principle. For me it hasn’t reached this yet – my problem is one of ‘openness’ versus ‘need to know.’ That classic argument summed up by Jack Nicholson – ‘You can’t handle the truth.’ An issue that has gotten me in a little bit of trouble before. In truth I am still trying to resolved this as I want to hold on to some of the stuff the Army instils; but not at all costs. Just because there is truth in the saying ‘you can take the boy out of the Army but not the Army out of the boy,’ I think you can choose what part stays. 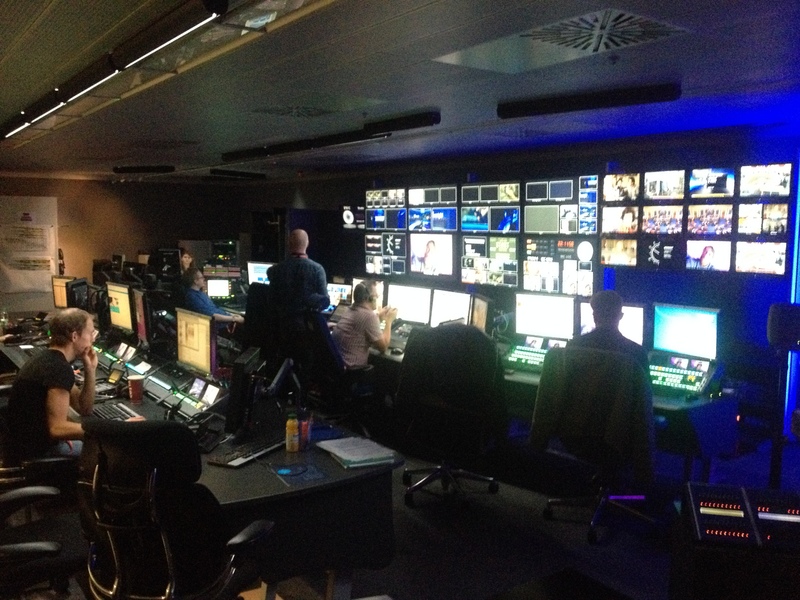 Next time… Out into the real world -understanding BBC Newsnight through the Army. Back in Bastion, media edited and released for public consumption, it was time to set to work on clearing up a backlog of articles and stories, and set up the next jobs, one of them being a footage request from the BBC for a future TV programme. 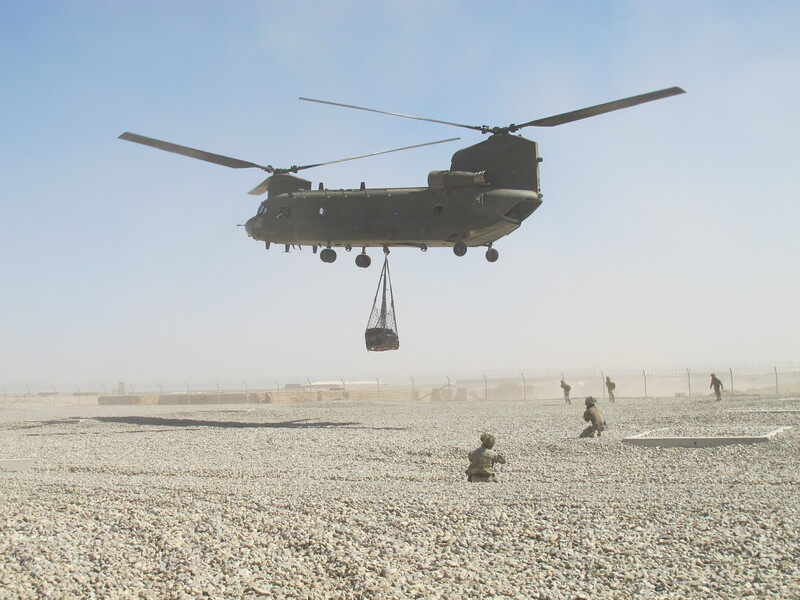 They required a shot of a Chinook carrying an under-slung load (a large net used to transport cargo). So having tracked down the relevant contact and found a day suitable for all parties, we headed down to the JAG (which is another MOD abbreviation and nothing to do with the car – Joint Aviation Group) to capture the required footage. We were given an initial briefing, told where to stand and how close we could get to the helicopter as the load was being lifted. Then it was time to head out to the HLS (helicopter landing site) to await it’s arrival, kitted out in full PPE (Personal Protective Equipment) which consists of body armour, helmet, gloves, ear protection (ballistic knickers and a nappy type contraption if you are going out on the ground). The body armour alone weighs approx 35lb so for a petite lady like myself it has been a bit gruelling at times carrying all the kit and I’ve had to learn to man up! The power and energy from this aircraft is immense! Within minutes the beast was flying above our heads. The sheer noise and power from its rotor blades is immense. The main issue though is the amount of dust it kicks up and the sheer force it generates, it can literally blow you right over. Paul and Dan got into action pretty quickly and captured the required footage and images from various angles. Job done! 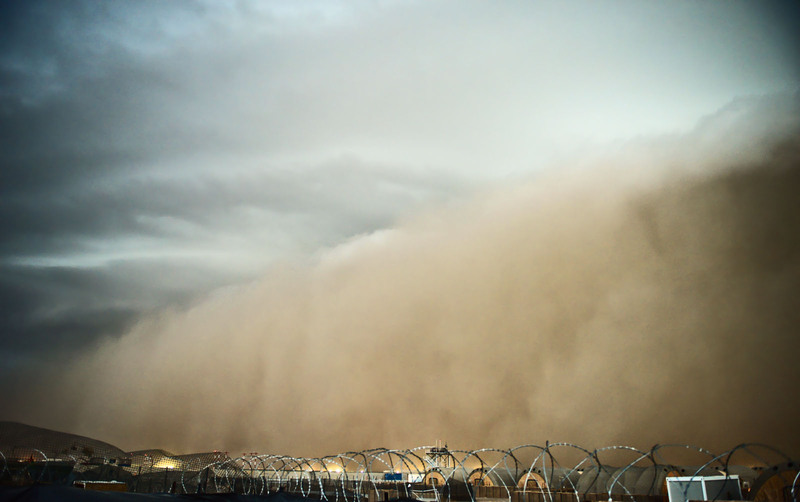 A few days later we experienced our own natural dust storm which swept through Bastion at some speed creating devastation in camps where doors and windows had been left opened. Normally we are given prior warnings but on this occasion there was none and within minutes the sky had turned a dusty orange colour. 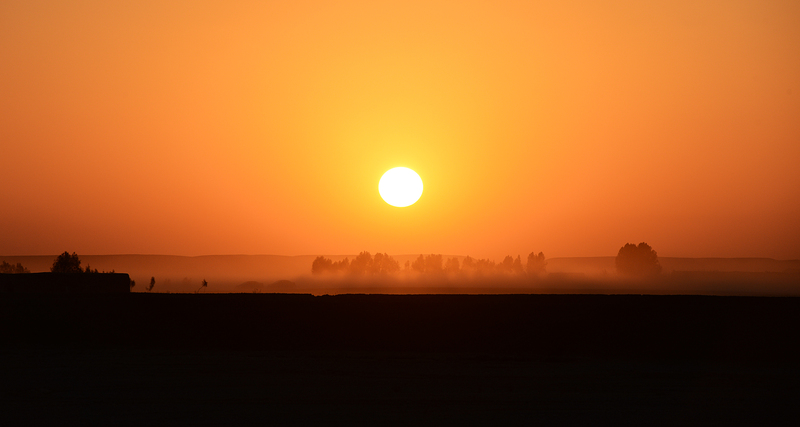 It was just like something out of the movies, with a dirty orange cloud of dust all around us. The safety glasses came in very useful for once. And I’m sure the layer of dust worked well as a substitute exfoliator in the absence of the usual beauty products! Paul and Dan took this as a perfect opportunity to put their photographic skills to the test. The taskings continue to flow in. They may not be as ‘war-focussed’ as the team would like but as the Afghan National Army (ANA) takes the lead in Helmand, British and ISAF troops are stepping back into a more of mentoring and training role which opens up opportunities of a different nature, and a variety of internal stories from the remaining patrol bases and within Bastion as troops draw back. Being out here away from all the usual creature comforts, as well as missing family and friends, I’ve been missing my pets and any sort of interaction with fluffy animals being very much a cat and dog lover. The wildlife in Bastion consists of the odd fox or rodent, a breed of enormous ants that can be found swarming around the camp, and in the smaller patrol bases you get the occasional stray cat or dog. My parents will be glad to know that I haven’t adopted any of the fluffy variety yet using my tour bonus to fly them back to the UK! So when the lads stumbled across an injured bird (or deformed, not quite sure if it was born this way), my maternal instincts kicked in. Unfortunately there wasn’t much to be done for this creature and rescuing the local wildlife doesn’t fit into our job spec. 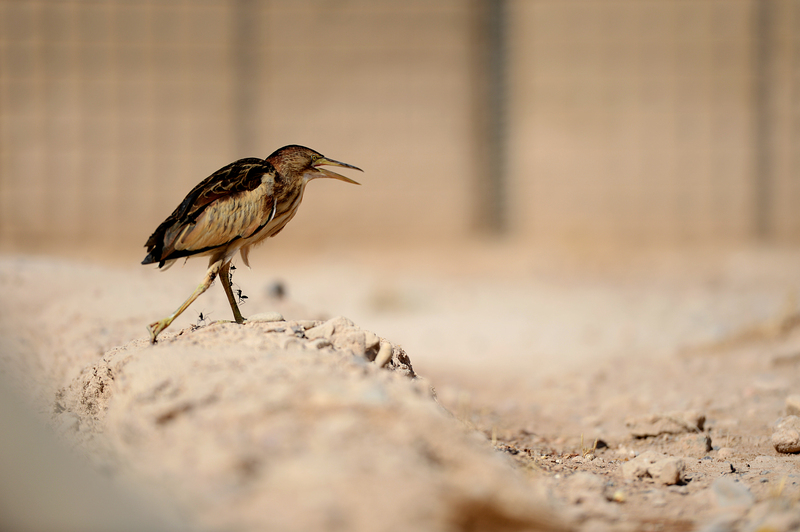 The bird seemed happy enough though and has found a temporary home outside the Media compound. So my quest to rescue a stray animal continues….! Not sure if he is injured or born this way? 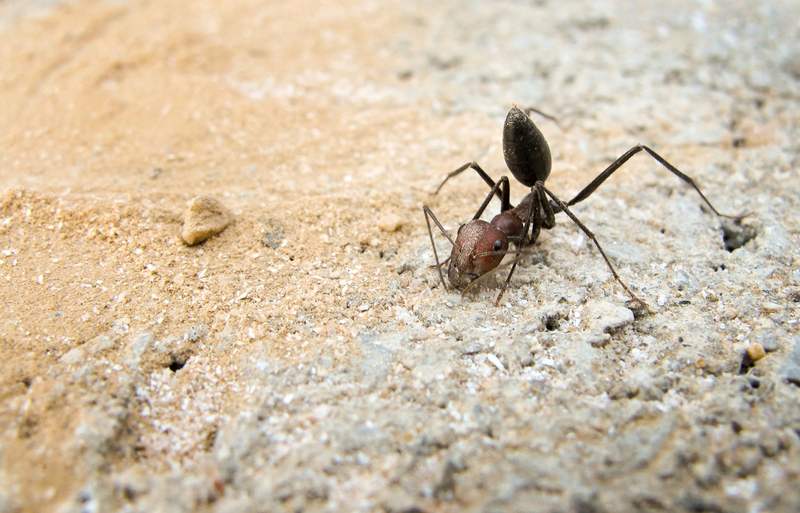 Have you ever seen ants this size before? 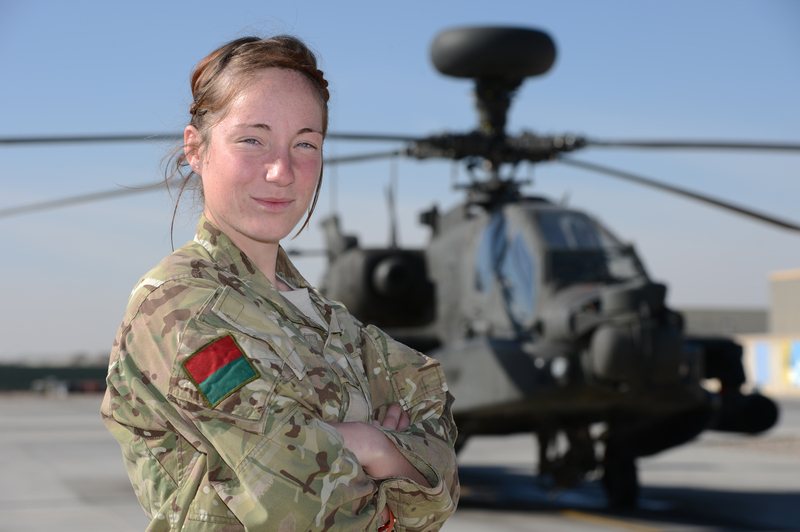 Lieutenant Claire Jackson is team leader for the British Army’s combat camera team for H19. She works alongside Sgt Dan Bardsley (photographer) and Sgt Paul Shaw (video cameraman). 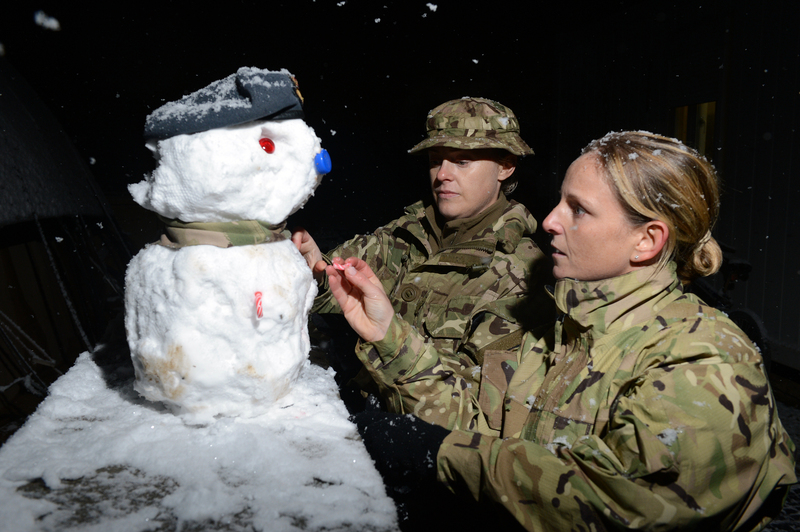 They are based in Afghanistan and will be covering the work of the Armed forces, in particular 7th Armoured Brigade – the Desert Rats, throughout the winter. They capture moving and still imagery from events out on the ground that national broadcasters don’t have access to. 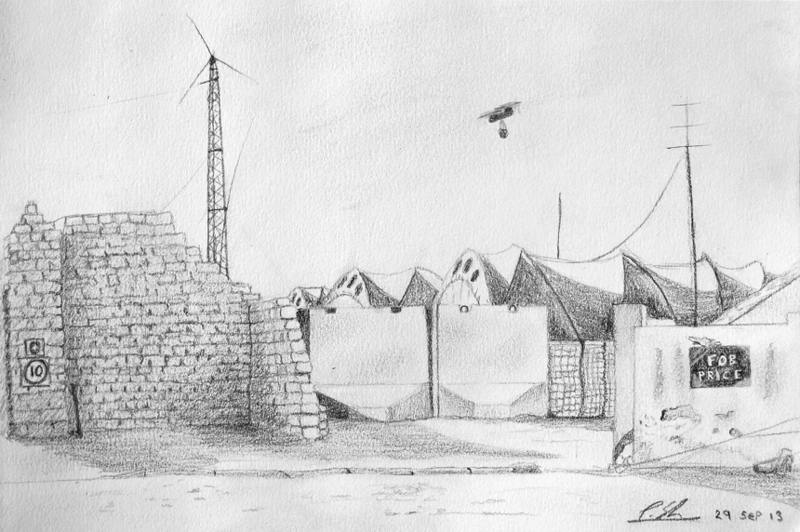 I’m currently sitting in Forward Operating Base (FOB) Lashkar Gah waiting for a flight back to Bastion. We came out here for a tasking near Kajaki but unfortunately it’s been put on hold for the day and we are required back at base for another job. We’ve been out here two months now and have had a reasonably busy tour so far with lots of taskings and last-minute changes which send all plans into disarray. Those of you who know me, know that I am ‘Little Miss Organised’ to the degree of putting Excel spreadsheets together for past holidays (something my boyfriend and family will agree proved very useful in terms of being able to fit in as much as possible into our trips!!) Therefore it’s been quite hard for me at times to adapt and just go with the flow when plans do get changed. It’s doing me good though. Before I go any further I must apologise for the use of military acronyms or jargon throughout this blog. When I first enlisted I was completely shell shocked by the amount of TLAs (they even have a name for them – Three Letter Abbreviations!!) the MOD uses in its everyday language and thought I would never understand what people were talking about. I can just about get by on most days now without having to use Google or the Army Arrse (Army Rumour Service) website to find out what certain abbreviations mean. My parents have insisted though that on my return to the UK, I’m only allowed to visit on the condition that I revert back to using the full English language and stop using military jargon! But for the rest of this tour, I’m sorry but I can’t avoid the use of it. Our first tasking was a low key government video project that was cancelled at the last minute. Feeling very sorry for ourselves and with all our kit packed and ready to go for the first trip out, we jumped for joy when we heard that we were being re-routed to Patrol Base (PB) Ouellette to cover the base handover to the Afghan National Civil Order Police (ANCOP). So having been in Theatre for only six days, suddenly we find ourselves outside the wire and at the flight line about to catch a Chinook out to Ouellette. I don’t have the best of ‘sea/air’ legs so was slightly apprehensive as we boarded the aircraft and didn’t really know what to expect. I just prayed I didn’t feel too sick as I didn’t want to look like a feeble woman out here on her first tasking with the team. But I had nothing to fear, the flight was awesome with some amazing views looking out of the back ramp, and I felt great! The ramp stays slightly open for the gunner to provide protection if necessary. We have been using the Chinooks regularly to fly in and out of bases, so much so that to me it’s almost like hailing a cab now. I feel right at home. Our stay at Ouellette continued to be a string of new experiences for me – the first one being told what a ‘desert rose’ is…..and it’s not a flower. Let’s just say this sort of rose was designed with male soldiers in mind. But with the invention of a female ‘She Wee’ (for those of you that don’t know what that is, it’s basically a funnel and a tube and I’ll leave the rest to your imagination) and me having been issued a nato green one prior to deploying (I had a test run in the shower before using it for real! ), I could now also use the desert rose if I so wished. But with the lack of a corrugated metal sheet which normally provides a small amount of privacy, I declined during daylight hours and opted for a wooden cubicle and a ‘john bag’ and then waited until darkness fell to put the plastic pipe to the test! PB Ouellette was a fascinating experience seeing how the soldiers outside the wire live, and inside this particular patrol base, how they provide security over Route 611 – a route I became fairly familiar with that first night when asked if we would help out on stag duty by keeping watch on a sentry post (sangar) for any activity beyond the base. The last time I did something similar was at Sandhurst during my Officer training when the only real threat was being attacked by the instructors. And now it was for real!